I have been to Disneyland one time and it was as magical as everyone says! I can't wait to head to Disney World someday soon with my children now that they are getting bigger and have them experience the wonder and amazement that every child feels as they enter and explore Disney World! While we would all love to visit the place where dreams come true on a daily basis, it’s not exactly cost-efficient. So why not treat any Disney fan to a new, personalized Disney gift from Simply Personalized, to add a little magic to their day? I know that is what we are doing while we wait for our magical trip to Disney World! One of the best products from Disney, apart from the films, is the abundance of books that bring the stories we all know and love to literary life. 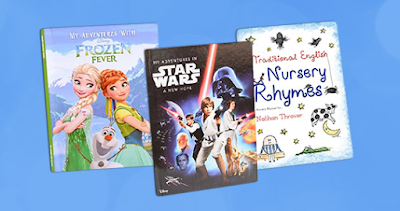 And the personalized Disney books from Simply Personalized are available in soft and hard back versions, and can be personalized with a range of details to create a bespoke gift for any recipient. Ranges include Frozen, Winnie The Pooh, Princess and Planes, just to name a few. I personalized two different books for my two children and they are so AMAZING! For my small Star Wars fan, my oldest son, this Personalized Star Wars Adventure Book makes the ultimate gift. He is going to LOVE the chance to star in his own adventure alongside all the famous characters! In the ultimate Kids Star Wars Book Princess Leia is being held hostage by Darth Vader and the Imperial Forces. Your child helps Luke Skywalker, Han Solo, R2-D2 and C-3PO to rescue the beautiful princess and help the Rebel Alliance restore freedom and justice to the Galaxy. And my daughter is now the star in the My Adventure Personalized Frozen Book! In the story, your child helps Anna to find her sister Elsa, whose icy powers have trapped Arendelle in eternal winter. Encountering Everest-like conditions, mystical trolls and a snowman named Olaf, they battle the elements in a race to save the Kingdom. Your child and their friends will love starring in this adventure Personalized Frozen Book alongside all their favorite Frozen characters! These books are really great and I love seeing my children's names as stars in their favorite books and Disney movies! These books will really encourage their love of reading and will be cherished for years to come! You can purchase personalized books from the Simply Personalized website.